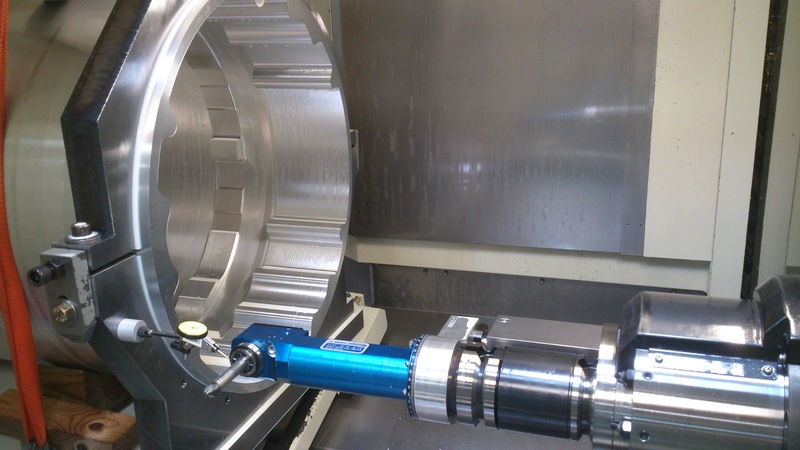 Issartel was one of the first industrial manufacturers in France to work with ESPRIT CAM software. When the company first decided to use CAM, it was to manage and program its first hot wire foam cutting machine. ESPRIT turned out to be the only solution capable of programming this type of machine. Issartel programs the right-angle head using ESPRIT. The Minerva group, created in 1996, designs and manufactures complex parts for the energy, transport and defense industries. The group has developed several integrated subsidiaries, each focused on a specific area of technical expertise. Among them is the Issartel company, which specializes in the manufacture of mechanical, hydraulic, and pneumatic systems. Minerva Issartel has facilities in three sites: Roche La Molière, where the company headquarters and main factory are located; Cherbourg, home to the company’s marketing and design center, and São José dos Campos, where the Issartel Do Brasil factory is located (the latter a subsidiary created in 2012 to provide support to NAVALGROUP for its technology transfer related to the supply of submarines to Brazil). They currently have a workforce of more than 65 people and expertise that is second-to-none in the creation of high value mechanical parts. Issartel’s accomplished staff and high-tech production have helped it become the leader in its field, attracting major clients like NAVALGROUP, ORANO, EDF, the CNIM, CEA and others. Today, the Issartel team is focused primarily on two main markets. One is the production of submarine parts, in particular those for the Barracuda nuclear attack submarine program. “No French submarine is built without some Issartel hardware,” states Pierre Saby, Technical Director for Minerva Issartel. The second market is the manufacture of storage containers for spent nuclear fuel, part of a very large development project for nuclear power group ORANO. To be able to produce these large-scale parts, the company has invested in a new 600 m² (6458 sq. feet) building. The high degree of accuracy required by the nuclear and defense sectors necessitates that Issartel maintain an equally high level of technical and industrial expertise. The company’s strong reputation is based on its mastery of operational processes such as project management, machining and specific welding of exclusive materials, installing and assembling high-quality mechanical systems, and inspection and testing to confirm that parts conform to design requirements. Issartel was one of the first industrial manufacturers in France to work with ESPRIT CAM software. When the company first decided to use CAM, it was to manage and program its first hot wire foam cutting machine. ESPRIT turned out to be the only solution capable of programming this type of machine. 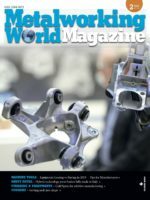 The company currently uses four programming workstations equipped with ESPRIT to operate its workshop equipment, which includes hot-wire cutting machines, numerically controlled lathes and multiple machining centers (Mazak, Kitamura, Huron, among others). The flexibility of the ESPRIT software enables Issartel to meet diverse manufacturing specifications, even those for highly complex mechanical parts. 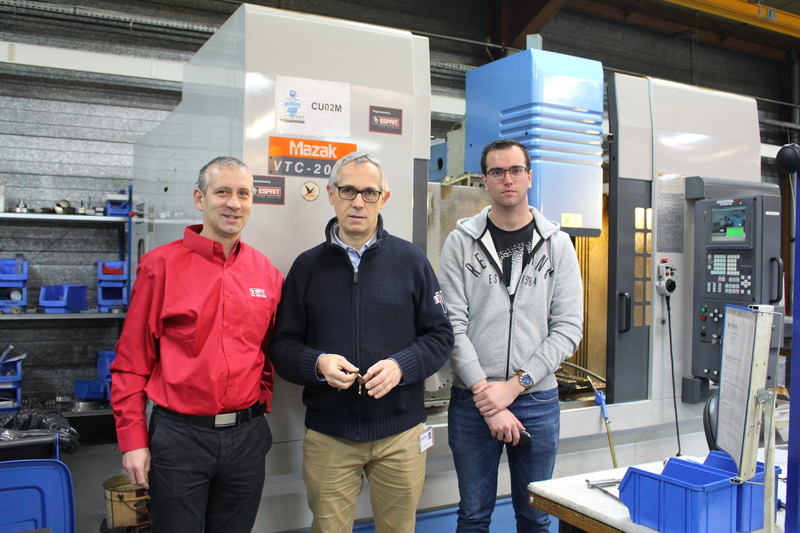 (Left to right) Patrick Gaspard, Mhac Technologies; Pierre Saby, Issartel and Aurélien Puppo, Issartel in front of the Mazak machining center. To illustrate the importance of ESPRIT’s flexibility, Issartel highlights one of its custom developments made for the CNIM Group, a French OEM and industrial engineering contractor. The job called for Issartel to manufacture a relatively complex part made of aluminium, which required complicated machining strategies. According to Aurélien Puppo, Method Technician and Programmer, the most complicated aspect of manufacturing this part was creating the complex nesting shapes in the interior and at the back of the part, which were out of reach when turning. 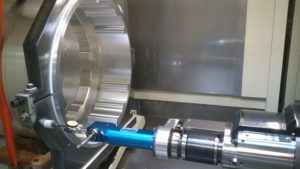 To machine the part, they chose to mill it with a right-angle head and an additional axis, which enabled them to use a remote milling head to make a correct pass. Programming this machine was a difficult task, but it was possible thanks to ESPRIT. The software’s simulation feature also enabled the programmer to anticipate the risks of collision, observe the entry of the tool in the machine, and make the necessary adjustments. On the screen the movement of the tool can be visualized, and the programmer can observe where it travels during the machining cycle. “Thanks to the flexibility of the software I was able to adjust the extension length of the head. This kind of programming is quite complicated and tricky because the operator has no way of adjusting the tool. Depending on the orientation of the part, there is a corrector which is applied in the milling head. We realize now that without ESPRIT we wouldn’t have been able to make this part,” explains Aurélien Puppo. In addition, ESPRIT’s factory certified post processors gave Issartel the advantage of post and go G-code that they did not have to edit. The degree of technical support that Issartel received from Mhac Technologies, the ESPRIT distributor, was another factor in their success. Mhac has continuously provided support to Issartel in the optimization of its CNC machines – specifically in the development of the post processors – in order to generate perfect ISO codes and secured programs. Saby emphasizes the importance of technical support and explains that for him, it’s a key advantage. “Everyone talks about software; that’s one aspect, but one has also to consider the customer service and technical assistance. The programmers are satisfied with the software and they highly appreciate the level of technical support,” says Saby. After all these years of using ESPRIT, Mr Saby knows the software very well and testifies to its ease of use and capacity to adapt to all types of complex machining. In the short term, Issartel intends to purchase more continuous five-axis machines from DMG MORI and plans in the long-term to expand internationally as far as Australia.